Every day, all around the world, thousands of tiny infants receive life-saving respiratory support. Critical to this modern-day miracle is the delivery of humidity. An immature airway is a fragile mechanism reliant on a delicate balance of temperature and humidity. It doesn’t reach maturity until age two. Respiratory interventions without humidity impede that infant's development and exacerbate the risks of medical interventions. Humidified therapy solutions help to emulate the natural balance that occurs in mature infant lungs. This in turn ensures that precious infant energy is used as nature intended: for growth and development. 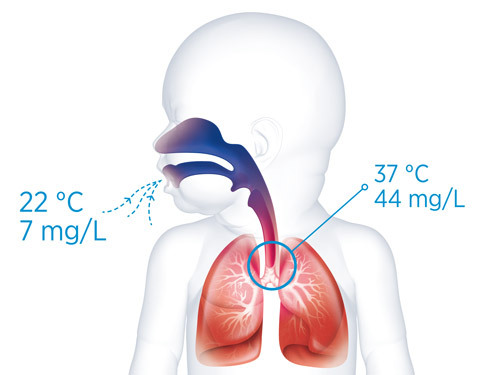 An infant’s respiratory system is a fragile mechanism reliant on humidity. Humidity supports two main lung functions: Airway Defense and Gas Exchange. The primary defense mechanism: Reflexes such as sneezing, coughing and gagging are supported by the natural filtration of nasal hairs and the upper airway. In an infant’s airway, these mechanisms are underdeveloped. Mucociliary transport – the second line of defense: The role of the mucociliary transport system is to trap and neutralize inhaled contaminants (in mucus) and transport them up and out of the airway. This keeps the lungs free from infection-causing pathogens. The efficiency of this mechanism is heavily dependent upon the age of the infant and the temperature and humidity of inspired gases. See the mucociliary transport system for more information. Air-flow to the alveoli is necessary for gas exchange to occur. The natural addition of heat and moisture (as gas travels down the airway on inspiration) assists with maintaining clear, open airways. Unobstructed air-flow is achieved by optimizing mucociliary clearance. This improves lung compliance and reduces bronchoconstriction associated with airway cooling. An infant’s airway produces proportionally more mucus (than later in life), but does not have the same ability to clear it away. This can influence the maintenance of an open airway and inhibit gas exchange. When an infant needs respiratory support, the natural balance of the airway can be compromised. Respiratory interventions without humidity impede development and exacerbate the associated risks.